Feb 11, 2015: Fifteen years ago, I tried teaching developers and videographers about the mechanics of story structure in London. These British stalwarts on the tech side piled into an office after-hours and sucked up that tenth cuppa. Fish-eyed, they were bludgeoned with “story” after eight hours of coding. Whereas a 20th century Writers Room consisted only of writers, the 21st century Writers Room involves a multiplicity of players from different disciplines. It wasn’t easy. Moreover, that process didn’t quite work. If it takes years for playwrights to learn how to craft a full-length piece, it’ll require more than a few off-the-track lessons for developers to spin drama. But I sensed then what I know now. As story and code blend to an ever greater degree, the need for a common language amongst storytellers, designers, technologists and makers becomes a necessity. How to drill down on the Internet era’s collaborative creative process and distill a new lexicon and design methods poses the challenge. Lance Weiler, founder of the Digital Storytelling Lab at Columbia University and pioneering filmmaker, and Nick Fortugna, co-founder of Come Out & Play and game designer, are hosting a yearlong experiment that’ll lead to some type of collaborative project. The prototype of this project will be performed in the 53rd New York Film Festival (October 2015) at Lincoln Center. The partners of Sherlock and the Internet of Things include the Digital Storytelling Lab at Columbia University, NYFF Convergence and the Brown Institute for Media Innovation. What the final project(s) will be — collaborators, structure, user experience, etc. — remains a mystery. To date, only two things are known: Sherlock and the Internet. Weiler and Fortugno conduct monthly meetups that gather anywhere from 25 to 40 participants. The expertise of this creative cadre spans several disciplines, such as game design, interaction design, storytelling, programming and UX. 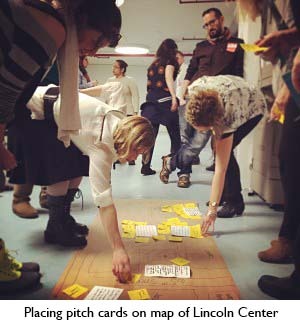 These meetups aim to forge an open collaborative space in which participants can “explore new forms and functions of storytelling.” They rotate between a few locations, including Lincoln Center, the Brown Institute of Media Innovation, Lincoln Center and Google. To understand the importance of what Weiler and Fortugno are exploring in Sherlock and the Internet of Things, boomerang to the 20th century and recall that the evolution of film and TV formats took decades. A linear production process emerged that suited linear formats in which viewers passively sat back and enjoyed being entertained. Given the birth of the Internet and the proliferation of wired devices, we’ve launched into a new era. For content creators, the question is how to use technology to innovate on story and create new forms of entertainment. The answer is: we don’t know the answers yet. It may take as many decades for 21st century forms of entertainment to mature. 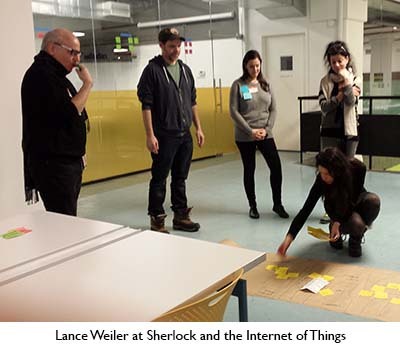 In the Sherlock and the Internet of Things meetups, Weiler and Fortugno are honing in on the creative process and giving media creators a collaborative design space for new forms of entertainment. They’re providing the triggers for discovery. As people brainstorm and work in this space, they can then document this process to better understand design methods that may or may not work. At this stage, failure is as critical as success. On January 30th, I attended a meetup at the Made in NY Media Center in DUMBO. According to Weiler, the Sherlock and the Internet of Things prototype had been run seven times in various cities — New York, Helsinki, Toronto and Ghent. At this meetup, participants would form teams, cluster skills and create user journeys. In terms of the lab, the meetup represented the first step in scoping the build of the project destined for NYFF 53. Participants selected a “role” from one of four selections: piece of technology, place where people gather, player or object. Your body assumed the role of that object. I chose the role of player and became an injured ballerina-turned-pickpocket. We mingled and brainstormed ideas for interactive concepts, and then formed teams. The teams honed in on a concept or idea for an interaction based on their chosen “roles” and the thematic construct of Sherlock. By using a well known sleuth, Weiler and Fortugno have provided participants with the constraints of the detective/mystery genre. The imposition of such constraints doesn’t limit one’s imagination, it actually unleashes it. In addition, Sherlock Holmes now resides in public domain, so we can dream up any which way to fiddle with the material. Once we nailed a concept, we then filled in back story and formed an elevator pitch. These pitches were placed on a map of Lincoln Center. Participants wrote down their skills on post-its and placed them next to pitches of interest. For some reason, most people stuck to their original groups and pitches. This tendency may have something to do with the investment already made in the people and the idea. As we spun back into our groups, we began to drill down into the user experience of the interaction idea. At this stage, it becomes tricky. It’s easy to get bogged down in details and what-ifs and lose sight of an overarching structure. Given that the teams were on a clock, our team raced to figure out the beginning, middle and end of the experience. We chose a scavenger hunt game structure which relied on augmented reality to provide users with clues. Other teams used virtual reality, audio files and online photo collages to create interactive user journeys — all informed by Sherlock Holmes and the solving of a crime. The teams shared their concepts in a feedback session. 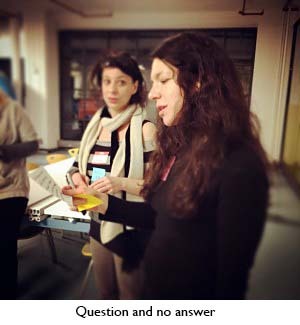 Two rules governed feedback: 1) those providing feedback did so by asking only questions, and 2) presenting teams couldn’t respond to the questions but only listen. As an old playwright, these are familiar constraints. You should never be put in the position to defend your work. On the other hand, it helps to receive feedback so you can improve the work. We retreated back into our groups and tried to use the feedback to progress our concept another notch. Two common pieces of feedback were “heighten the stakes” and “go global.” Weiler kept inserting: can you use the Internet? While boosting the danger level of a story is standard 20th century fare, reaching an international audience via the Web is a new consideration on a media creator’s plate. 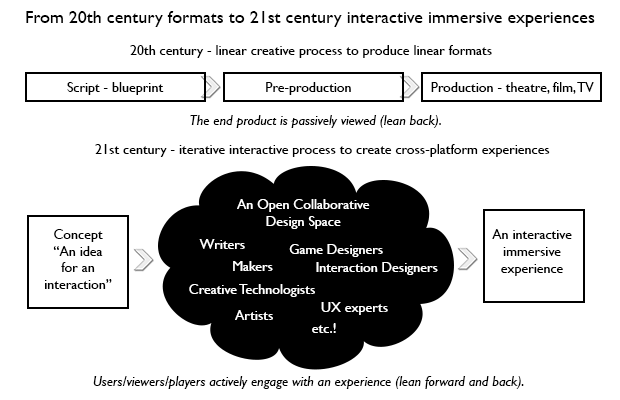 The creative process for an interactive concept resembles that of developing software – it’s iterative. The know-how of story and technology begin to bleed into each other. For traditional storytellers who’ve been steeped in Aristotle’s “Poetics” and rigid three-act screenplay structure, these design principles should hit them over the head like a ball-on-a-chain bludgeon. Given that millennials expect to interact with content — play with it, mash it up, regurgitate it in another form — media creators and producers can’t afford to stick their heads in the sand. The times are a’changing. And these days, things change fast. Hats off to Weiler and Fortugno for charting a course through this new frontier and taking their bloody time to do it. Instead of a two-day quick hack, a yearlong experiment may be what’s needed to lay the foundations for 21st century storytelling in the decades ahead.